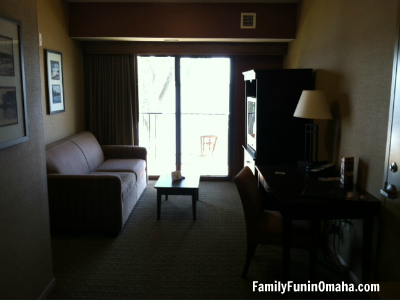 Are you looking for a fun family vacation within a few hours drive of Omaha? 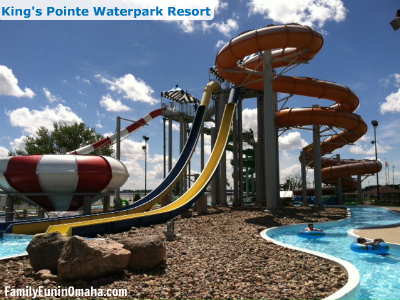 King’s Pointe Waterpark Resort is located in Storm Lake, Iowa, about 2.5 hours from Omaha. 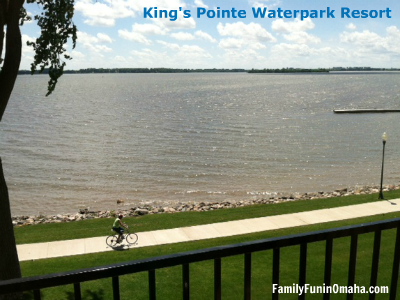 We first discovered King’s Pointe through a Living Social deal and visited over Spring Break. We loved the indoor waterpark so much, that we wanted to return in the summer to try the outdoor waterpark. It turned out to be a perfect family vacation, full of water fun, bike rides, and creating memories together. 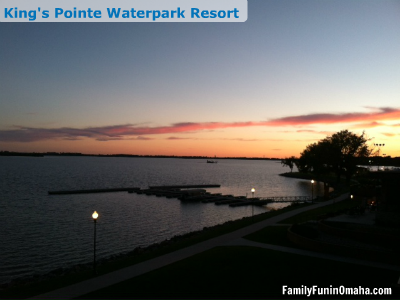 The resort is located right on Storm Lake – this was the view from our room! The bike trail was easily accessible, and we enjoyed our early morning ride to the nearby playground and lighthouse. The kids enjoyed watching the ducks swim by and the fisherman fish from the nearby docks. The outdoor waterpark offers fun for all ages, with 2 diving boards, large swimming area, lazy river, and 5 waterslides! The kids loved the raft waterslide on the double tubes that allowed for parents to ride with their children easily. The zero depth entry and special kiddie area with two small slides are perfect for the younger children! During the summer, they also offer rentals including pontoons, kayaks, paddleboards, peddle boats, aqua bikes, and canoes. Life jackets are provided for these activities as well as the waterparks. The Indoor Waterpark, open year-round, is packed full of fun options. Our favorite was the tube waterslide, perfect for us to ride together. 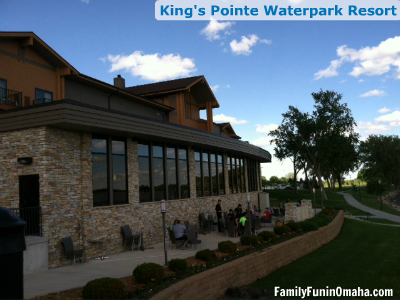 With two young children, we found King’s Pointe to be ideal, because they could ride on two of the indoor waterslides, ride along in the lazy river, try climbing across the lilypads, play in the zero depth entry, and climb all around the kiddie area. Plus, there was a lot of space for kids to swim or play basketball. The snack shack was perfect for lunch – with our recommendation going to the chicken sandwiches. Overall, we loved the indoor waterpark as much as the outdoor one! 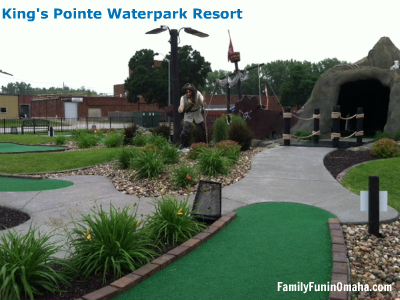 The Pirates Pointe Mini Golf course is right next door, full of challenging holes, waterfalls, and pirate-themed fun. The staff was very helpful and professional. The lifeguards were constantly walking around monitoring the entire waterpark, ready to help if needed. We enjoyed the breakfast buffet at the Regatta Grille during our visit in April, which offered a beautiful view and delicious food. 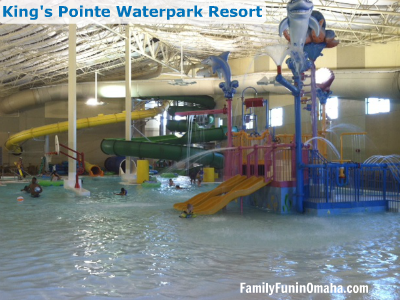 We highly recommend King’s Pointe Waterpark Resort!